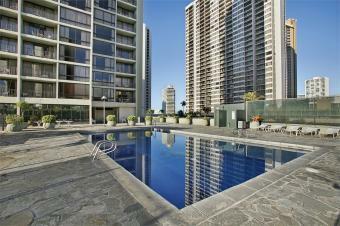 Aqua Skyline at Island Colony infuses the Waikiki cityscape with contemporary urban design. 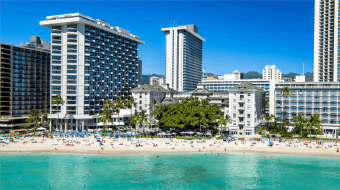 The hotel is situated across the road from the Ala Wai canal and is an easy stroll to Waikiki Beach as well as the many shops and dining options along Kalakaua Avenue. NOTE: From price based on a Studio Panoramic City View Kitchenette Room, Promotional rate, for travel on selected dates between 2-20 Sep & 14 Oct - 26 Nov 19 . Hotel pricing is dynamic and is subject to availability. Please ask your travel agent for the best available rate on the day. An Amenity Fee of US$25 plus tax per room per day is payable direct. Bonus: Save 10% on your hotel stay, (discount already included in the price). Conditions apply. Located just a short walk from Waikiki Beach and close to Kapiolani Park, Aston Waikiki Sunset provides spacious apartment style accommodation with a choice of both one and two bedroom suites. Each suite is tastefully decorated with a relaxed Hawaiian style décor and comes complete with separate living area, bedroom, private balcony and fully equipped kitchen. 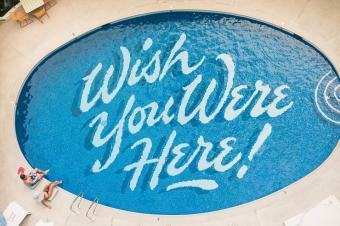 Other resort facilities include an outdoor swimming pool, tennis courts, BBQ grills and more. NOTE: From price based on a One Bedroom Partial Ocean View Suite, Promotional rate, for travel on selected dates between 21 Oct - 19 Nov 19. Hotel pricing is dynamic and is subject to availability. Please ask your travel agent for the best available rate on the day. An Amenity Fee of US$25 plus tax per room per day is payable direct. 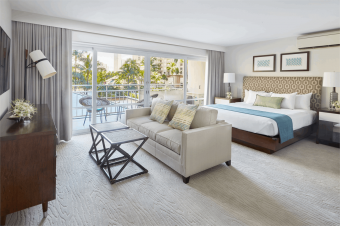 Located on Ala Moana Boulevard, close to the Marina and within easy reach of the Ala Moana Shopping Centre, the Ilikai Hotel & Luxury Suites offers upmarket spacious accommodation with all the comforts of home. Each Junior Suite features a combined living area and bedroom with private lanai, plus full kitchen facilities complete with stainless steel appliances and granite countertops . The hotel features two swimming pools, fitness centre, spa, onsite restaurant plus a range of other facilities and is an easy stroll to both Ala Moana Beach Park and Duke Kahanamoku Lagoon. 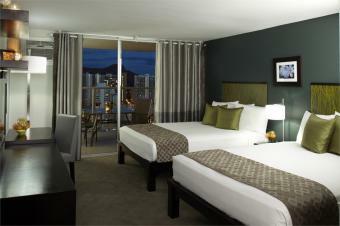 For families looking for extra space, the Two Bedroom Suites at the Ilikai are the perfect option. NOTE: From price based on a Luxury Junior Suite Partial Ocean View, Promotional rate,for travel on selected dates between 22 Oct - 19 Nov 19. Hotel pricing is dynamic and is subject to availability. Additional accommodation surcharges may apply on selected Thu-Sat nights. Please ask your travel agent for the best available rate on the day. An Amenity Fee of US$25 plus tax per room per day is payable direct. Bonus: Save 15% on your hotel stay, (discount already included in the price). Conditions apply. One of Oahu's true resort style hotels, the Hilton Hawaiian Village occupies 22 oceanfront acres on beautiful Waikiki Beach. 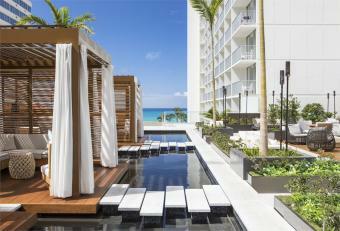 Encompassing five towers, 20 restaurants and bars, five swimming pools and over 90 shops and boutiques, the Hilton creates a unique village style experience unlike anything else in Waikiki. NOTE: From price based on a Resort View Room, Paradise Made Simple rate, for travel on selected dates between 13 Aug - 20 Sep, 14 Oct - 9 Nov & 15-30 Nov 19 . A Daily Resort Charge of US$45 plus tax per room per day is payable direct. Upgrade Offer: Upgrade to an Ocean View room from an additional $139 per person. Conditions apply. NOTE: From price based on a One Bedroom Suite, 5th Night FREE rate, for travel on selected dates between 2-20 Sep & 15 Oct - 30 Nov 19. Hotel pricing is dynamic and is subject to availability. Please ask your travel agent for the best available rate on the day. An Amenity Fee of US$25 plus tax per room per day is payable direct. Bonus: Includes one night FREE, plus extend your stay and receive every 5th night FREE. Also includes a FREE Early Check In & Late Check Out subject to availability. Conditions apply, offers only valid when booking Suite categories. NOTE: From price based on an Ocean View Room with Guaranteed Upgrade to a Diamond Head Ocean View Room, Hawaii Exclusive rate, for travel on selected dates between 19 Aug - 20 Sep & 14 Oct - 30 Nov 19. Exclusively for you: Includes: * One night FREE, plus extend your stay and receive every 5th night FREE, * Guaranteed upgrade from an Ocean View to Diamond Head Ocean View Room. * USD$150 Resort Credit per room per stay * One-time 2 course lunch for two at O Bar (excludes drinks) * Daily Resort Fee (valued at $60 per day^) providing Wi-Fi, Swell Pool Deck amenity and treats ,access to Island Club and Spa Fitness facilities & more! * Conditions apply, ^resort fee payable on any additional free nights. NOTE: From price based on a Historic Banyan Room, Hawaii Exclusive rate, for travel on selected dates between 19 Aug - 20 Sep & 14 Oct - 30 Nov 19 . A Daily Resort Charge of US$38.74 per room per day is payable direct. A maximum of two people permitted in a Historic Banyan Room. Exclusively for you: Add a touch of indulgence to your stay with these exclusive benefits valued at $350 per couple per stay! Receive two-day access to the Beach Club at the Moana Lounge for two adults per stay. The Beach Club provides continental breakfast in the morning as well as appetizers and cocktails in the evening. 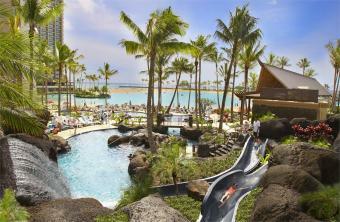 PLUS receive two one-day access passes per room per stay to enjoy the facilities at the oceanfront Moana Lani Spa. Conditions apply.